Growing up I called my mom’s friends by their first names, with the addition of the Southern conventional title of respect, Mr. or Miss. To this day, in my mid-30’s, I still think of my mom’s friends as “Miss Irene and Mr. Joe”; “Miss Trina and Mr. Stuart.” My brothers and I called our stepdad “Mr. Bob”, simply because that’s how my mom introduced us to him, and the name stuck, even during their marriage. Mr. Bob loved grits for breakfast. Cooked smooth and creamy with a dollop of butter on top. I didn’t realize until I was older that polenta is just a fancy name for grits. It’s all stone-ground cornmeal, whether white cornmeal or yellow. Although I remember Mr. Bob’s grits were always white, while all polenta meals I’ve made and eaten have been made with yellow cornmeal. 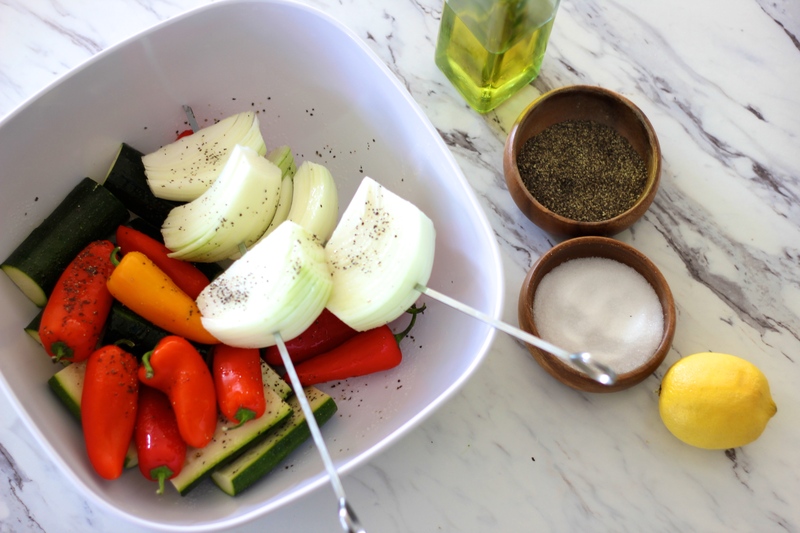 Super easy: chop the veggies in large chunks, skewer the onions so they don’t get all wiley on you and fall through the grill grates, olive oil, s+p, and lemon zest. While the veggies are grilling, cook up the polenta, and then serve family style. My husband doesn’t mind sharing a plate with me…and I love eating family style mainly because it means less dishes. Doing dishes is not so dreamy. Make the polenta according to package directions. The key to creamy polenta is to really follow the directions and let it cook for a full 30 minutes while stirring! Prep your grill and allow appropriate time to get sizzling hot. Prep the veggies: Place in a large bowl and drizzle with olive oil, s+p, and lemon zest. 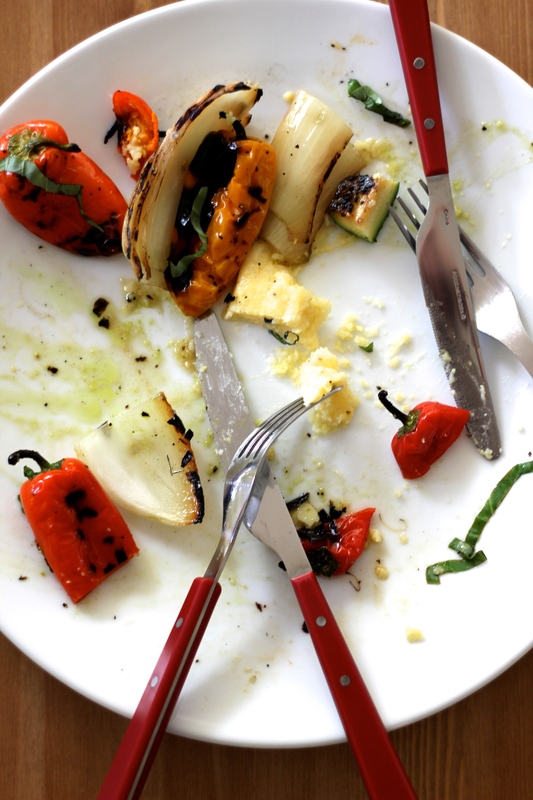 Grill the veggies, turning occasionally, until yummily charred and cooked. 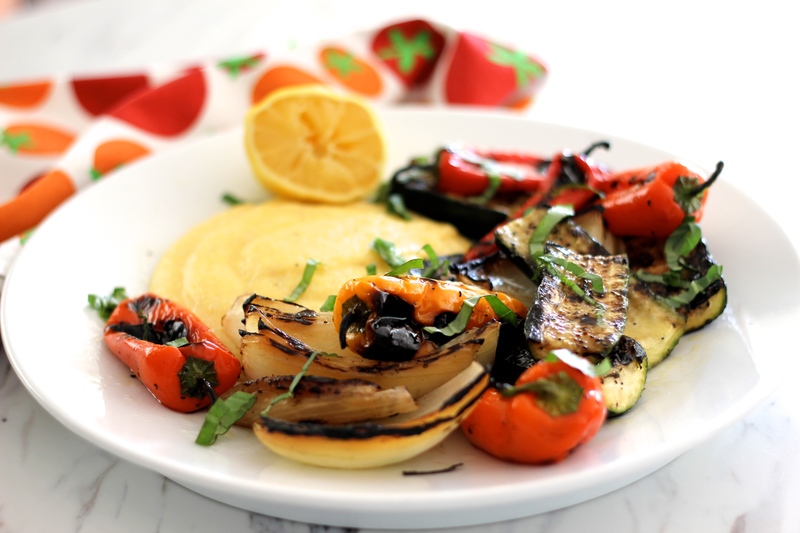 To serve, divide the polenta evenly among plates, top with an assortment of grilled veggies, sprinkle with fresh lemon juice and basil. 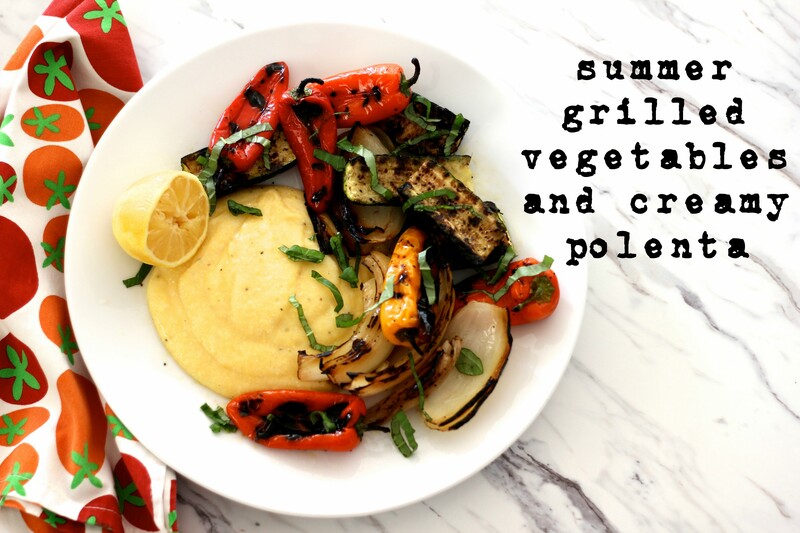 Alternately, serve family style, piling the polenta and grilled veggies on one large plate. We spent a week in May visiting my family in Virginia. It was my first visit back in six years, and our first as a family of four. As you can imagine, one week was not nearly enough time to spend with my extended family, a few days at the (very unseasonably cold) beach, and head downtown to Connecticut Ave in Washington DC. One week was enough time, however, to remind me where my culinary heart lies: The South. 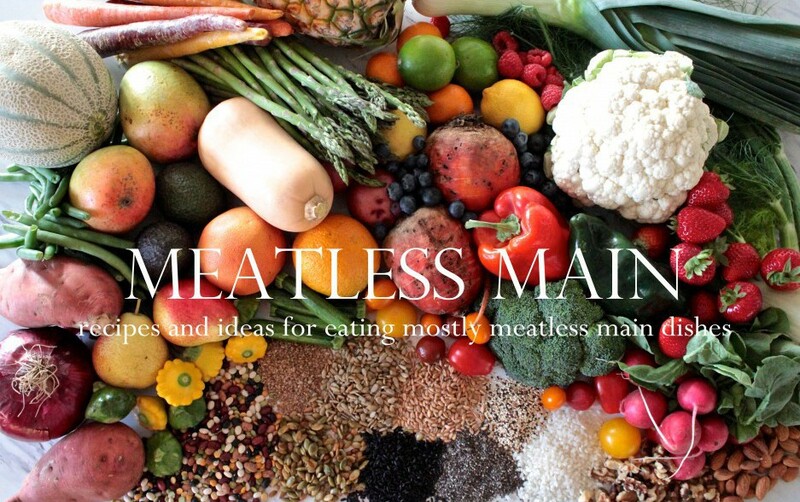 I simply adore all the creations that, in life pre-refrigerator, were evidence of living providently–putting up the summer harvest to enjoy through the winter. I of course got a cookbook while we were there, and I’ve been in a tailspin, making stewed blackberries, cornmeal puddings and hoecakes, chutneys, succotash, sweet potato biscuits and honey pecan butter. Oh. Man. Welcome Spicy Apricot and Nectarine Chutney. Chutneys are chunky condiments made with fruits and vegetables, and cooked down with vinegar, spices, and sugar. They are pretty simple to execute–load everything into a pot, cook down while stirring, and serve hot or can for later. I adapted the apricot chutney recipe from Dishing Up Virginia, doubling the amount of apricots called for, using nectarines instead of peaches, and switching out the habanero for jalapeño. 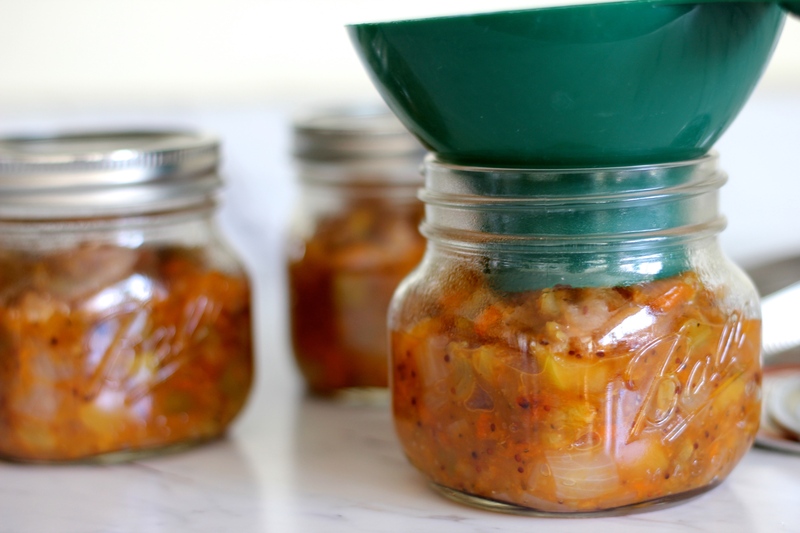 The author of the cookbook offers up a great tip about chutney timing: “Overcooked chutney can become a solid brick; undercooked chutney is too runny.”–make sure your chutney is above 185F. 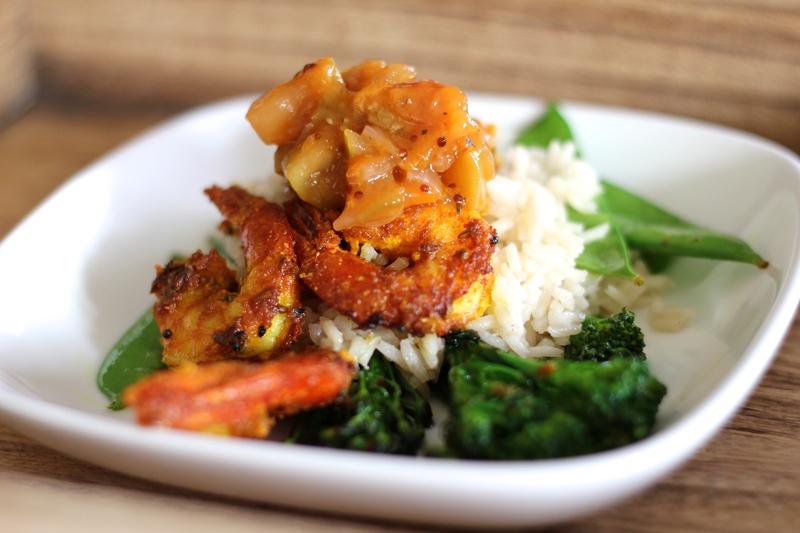 This particular chutney was begging for an Indian companion, so Indian 5-Spice Shrimp it was. I simply marinated the shrimp with turmeric, salt, and Indian 5-Spice, then quickly sautéed in olive oil over medium-high heat. 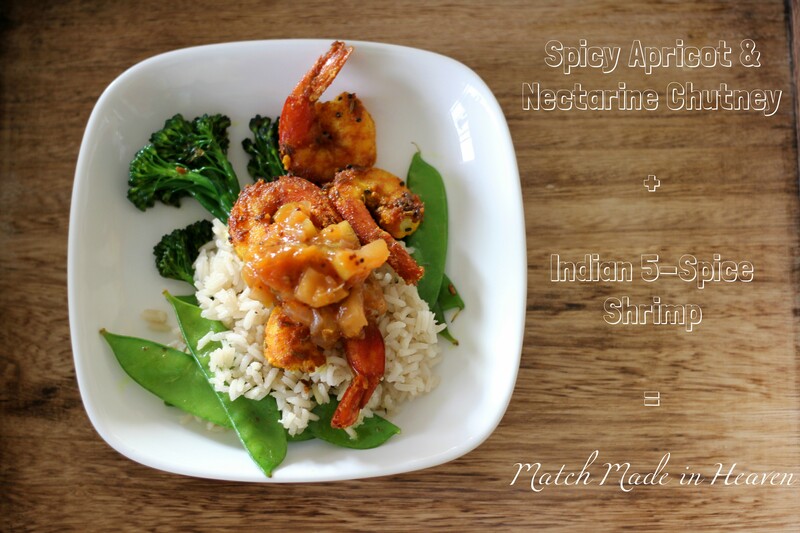 This dish was sweet, spicy, fragrant, and so flavorful you’ll have to have seconds. 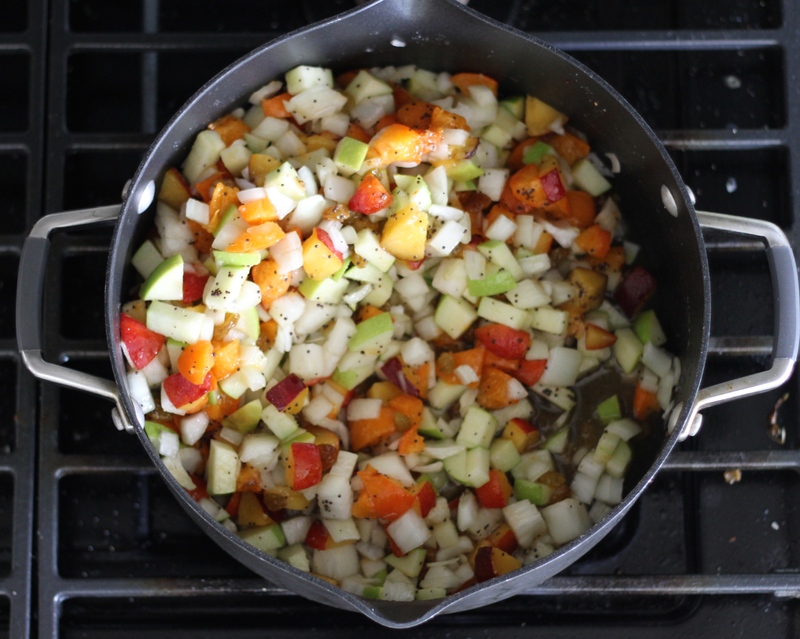 Combine all ingredients in a large stockpot over medium heat. Cook until the fruit has softened and darkened in color, about about 30 minutes, stirring frequently. Continue cooking and stirring until the mixture has darkened, about another 15-30 minutes, depending on the ripeness of the fruit (the riper the fruit, the quicker the cook). You’ll know the chutney is done when you draw your stirring spoon across the bottom of the pot and see the bottom for one to two seconds. As soon as this happens, remove your pot from the heat. At this point the chutney is ready to eat right away, or you can can some for later. To can, ladle the chutney into three prepared pint jars, leaving about 1/4-inch of space at the top of the jar. 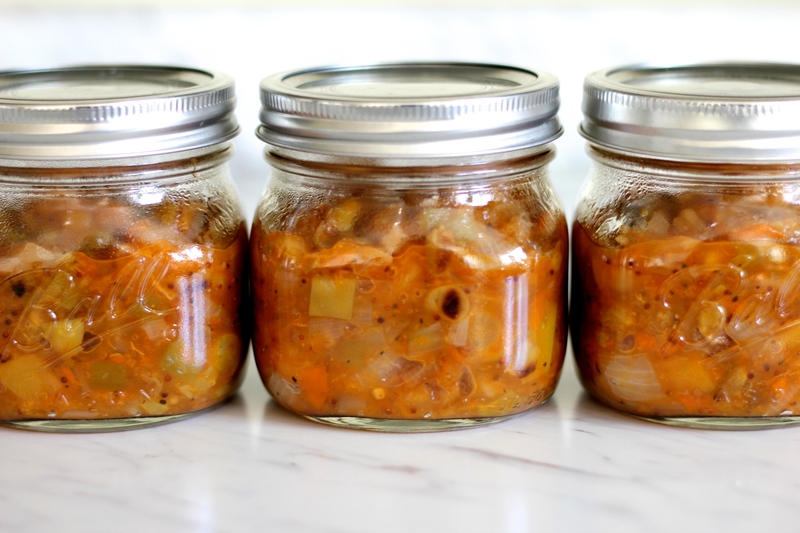 Top the jars with clean lids, close tightly, and let cool to room temperature. Make sure jars have sealed properly; if the lid bounces back when you press your finger on the center button, it hasn’t sealed properly. To reprocess and seal, set the jars in a hot water bath covered by at least 2 inches of water and let process for at least 15 minutes. Let cool and test the lids again.